Jazz Jam Sunday, April 28th!!! Interested in becoming an SAJS Corporate Sponsor??? Download the contract below which has more details about the different sponsorship packages we offer! You can mail the contract to the address below. Please give us 7-10 business days to confirm that your sponsorship has begun. Come "Swing into Spring" with the St. Augustine Jazz Society. There will be a contest for the Best Easter Bonnet! Be sure to come dressed for our Easter and Spring theme! Any and all musicians are invited to join! All proceeds collected go towards the SAJS Scholarship Fund to support young musicians! Attention SAJS Musicians (Instrumentalists, Vocalist, Groups, Combos, etc.)!!! If you would like any events that you will be performing at to be included in the "SAJS around St. Augustine" section of our "Upcoming Events" page, please fill out the form below. We ask that you please allow 3-4 business days for the events to be published. 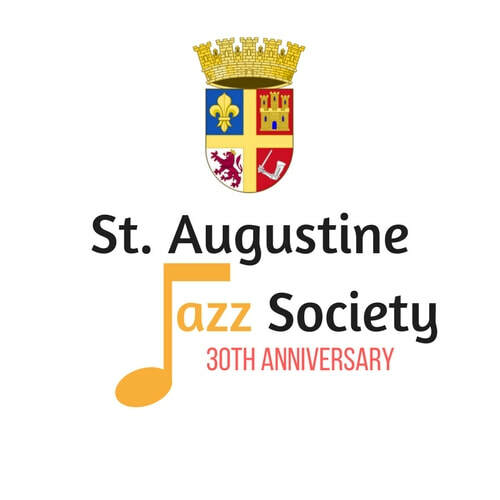 Read about the history of the St. Augustine Jazz Society!